RICM was started in order to provide the students with management training in agriculture field. The faculties are highly experienced and provide the students with modern teaching and learning pedagogy in order to achieve social and economic development of the nation. The curriculum is designed in such a way it provides the students with knowledge about the modern techniques used for the agricultural improvement. 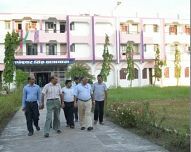 The facilities of the campus provide the students with home like feeling for overall development. The placement cell use modern techniques in order to develop the character and personality skills among the students. The placement cell has air conditioned halls where group discussions and pre placement meetings and interviews are conducted and computer labs where online tests are conducted. Oracle, Axis Bank, Microland, Amazon, Ebay, CGI, Toshiba, Target, Tech Mahindra, Wipro Technologies, Adobe, Dell, HCL and IBM etc. are some of the top recruiters. Write Your Reviews on "Regional Institute of Co-Operative Management"
Are you Interested in "Regional Institute of Co-Operative Management"? Please provide the following details. Ask Question on "Regional Institute of Co-Operative Management"?